I am writing this tonight from Las Vegas. Today I watched the Pillsbury Bake Off and it was a celebration of the home cook. I loved it. Had a great time, and will share more about the experience in a few days. Tonight though, we are going to talk about chefs. Food + Wine celebrates a new chef every year and has done so for the last 25 years. Chefs that are now household names. Thomas Keller, Nobu, Tom Colicchio, Eric Ripert are just a few that have gone on to huge and great culinary achievements. While I am a home cook, and am proud to be one, we can always learn new things from chefs that have made careers out of achieving culinary perfection. Creating new techniques and finding new flavor profiles that we can bring into our homes. Food & Wine has published a new cookbook celebrating these chefs and asked me to cook one of the recipes from the book. 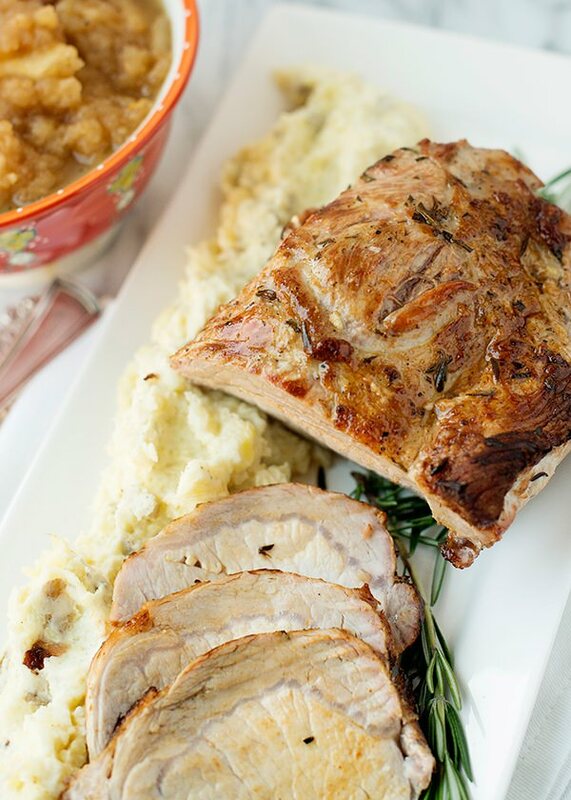 I chose the Garlic and Rosemary Pork Loin from the 2008 winner, Ethan Stowell. 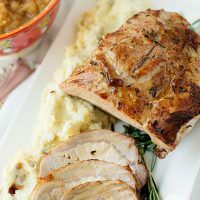 While this recipe is about as simple as a roast pork recipe can be, it teaches a technique that can be used for many other applications. Beef, chicken, lamb. 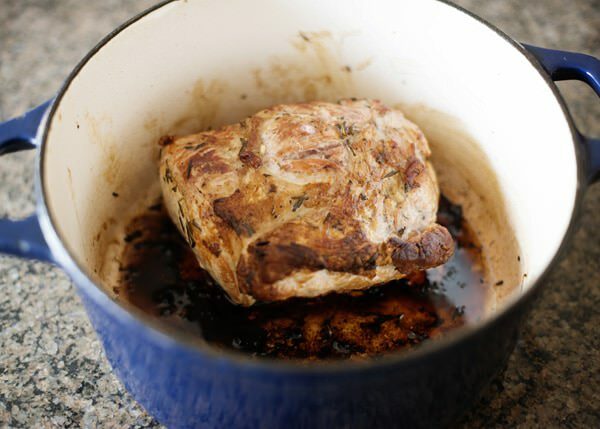 It is flavorful, and a great basic recipe that you can use to get your feet wet when it comes to roasting meats. I can be put off from roasting meats sometimes because I am afraid of not knowing when it is done or overcooking it. This recipe came out perfectly, and will become a staple. I made this on a weeknight, with homemade apple sauce and mashed potatoes. It was a cozy fall dinner. 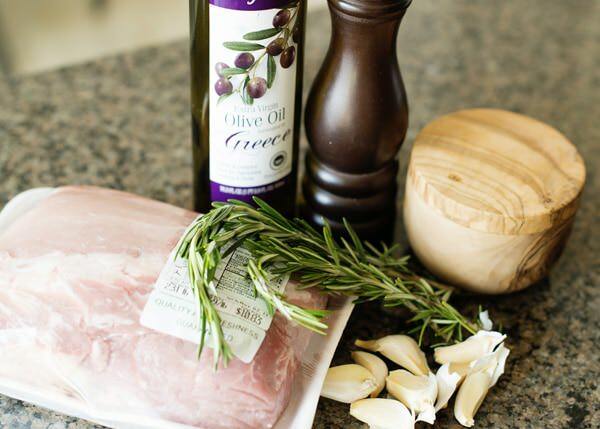 In a small bowl combine 1/4 cup olive oil, chopped garlic, rosemary, salt, and pepper. 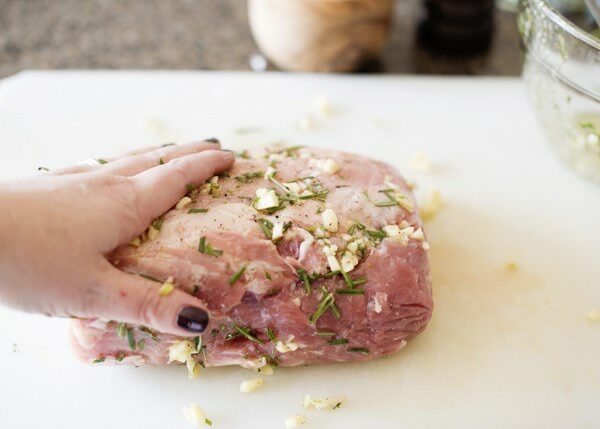 Rub all over the pork, including the top, bottom, and sides. Put the pork in a plastic bag. Marinate overnight in the fridge. 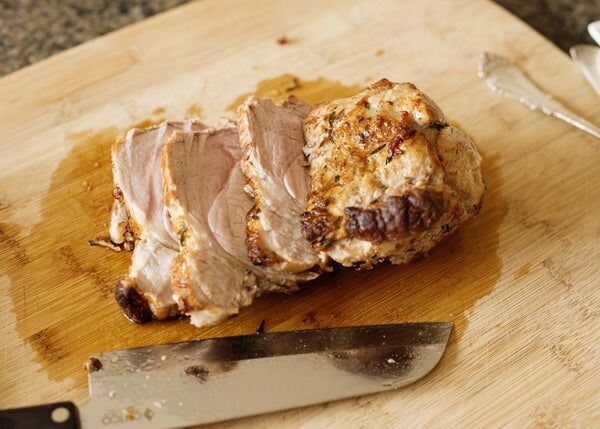 Take the pork out of the fridge and let stand at room temperature for 30 minutes. Brush off as much marinade as you can. I love this thermometer. When I cook any sort of roast, I use a thermometer to tell when it is done. 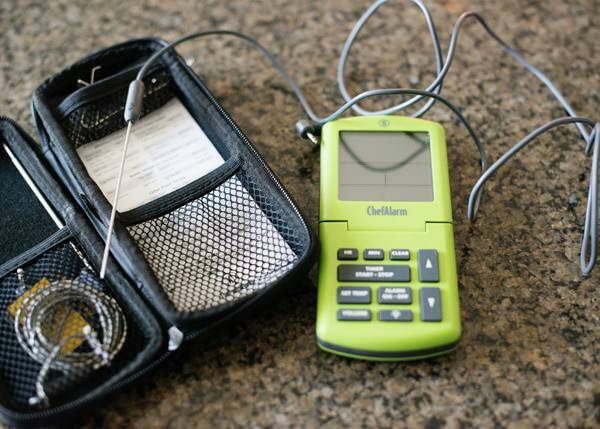 I have bought many cheap digital thermometers and I think this it is entirely worth it to buy a high quality one. This particular model comes with a nice case and has a magnet on the back so you can stick it directly on your oven. You set the desired temeprature and it alerts you when it has reached it. No more guesswork. Love this thing. I use it for making candy and frosting too. Heat a large oven proof skillet over medium-high heat. I used a Dutch oven because it is the perfect size for this. Add 2 Tablespoons oil and heat until it begins to shimmer. Add the pork and cook until brown on all sides. This takes about 10 minutes total. Transfer to preheated 400 degree oven and roast for 40 to 45 minutes, or until a thermometer registers 135°. Transfer to a board and let rest for 15 minutes before serving. Slice into thin pieces. 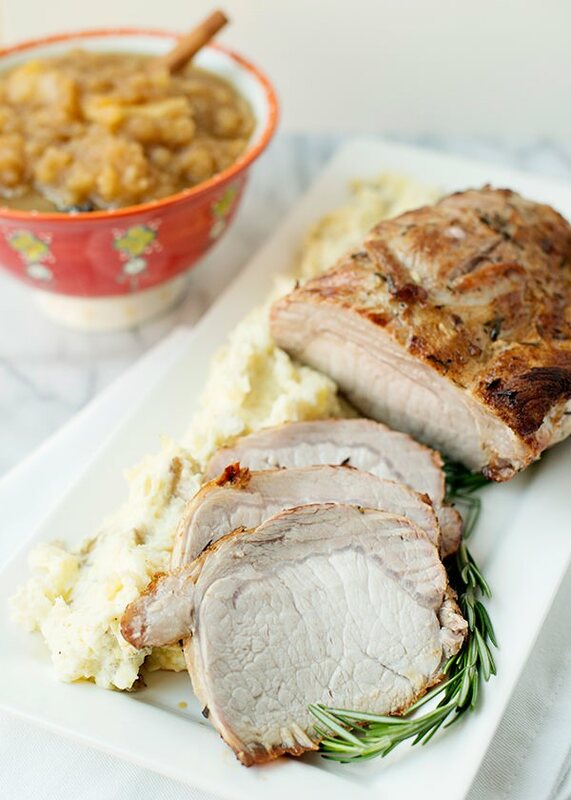 Serve with homemade apple sauce and mashed potatoes. 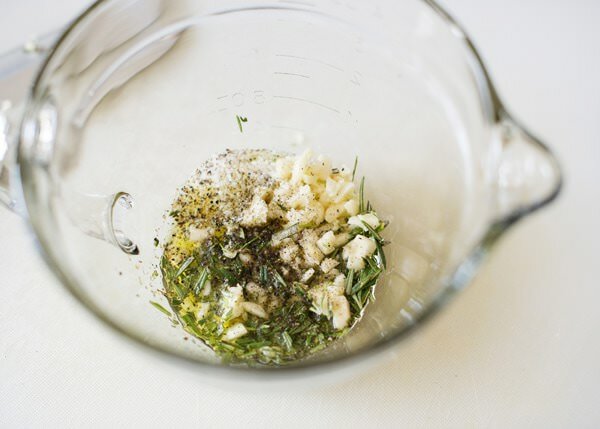 In a small bowl combine 1/4 cup olive oil, chopped garlic, rosemary, salt, and pepper. Rub all over the pork, including the top, bottom, and sides. 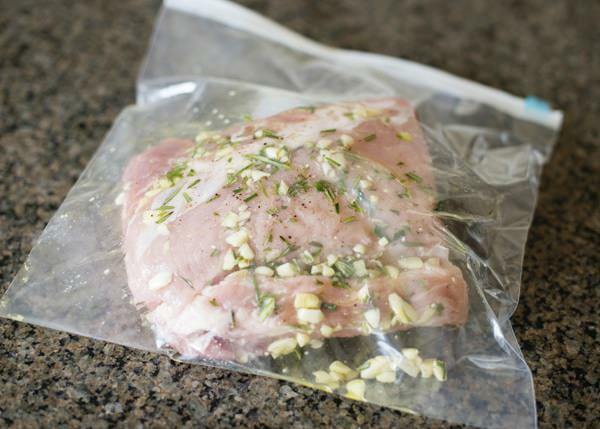 Put the pork in a plastic bag. Marinate overnight in the fridge. 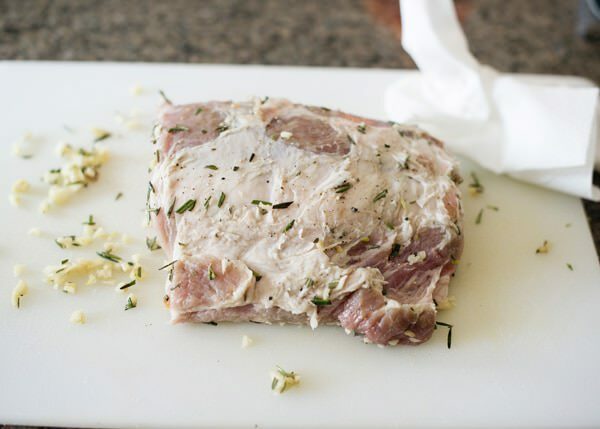 Take the pork out of the fridge and let stand at room temperature for 30 minutes. Brush off as much marinade as you can. Heat a large oven proof skillet over medium-high heat. Add 2 Tablespoons oil and heat until it begins to shimmer. Add the pork and cook until brown on all sides. This takes about 10 minutes total. Transfer to a board and let rest for 15 minutes before serving. Slice into thin pieces. Exactly what I was thinking! Your pork loin looks terrific Bree! Thank you! This dinner was so good. The applesauce is a must! Absolutely! I use apple sauce instead. When you are a born and raised Northerner, it has to be apple sauce! Gosh this looks yummy! I’m really into cooking pork at the moment so am really looking forward to trying this out! This was so easy, and probably the best dinner I have made all fall. 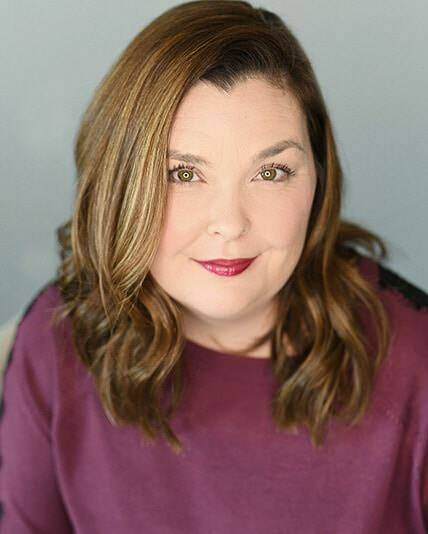 First time on your site and I wanted to say your pictures are lovely! Merry Christmas! 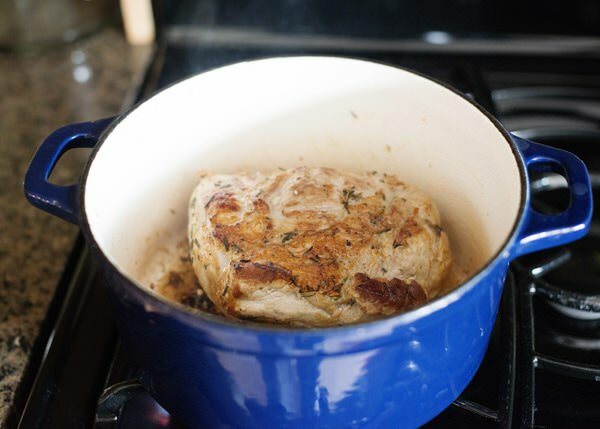 Your recipe for the garlic and rosemary roast pork was delicious, but per the revised USDA (May 2011) recommendations, I cooked the pork to an internal temperature of 145 degrees Fahrenheit, followed by a 3 minute rest time. The revised temperature recommendation allows the pork to cook thoroughly enough to kill trichinosis, but remain moist and delicious. 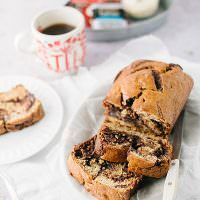 Thank you for your recipe and blog. I’m not worried about trichinosis. But by all means, cook to whatever temp you like.